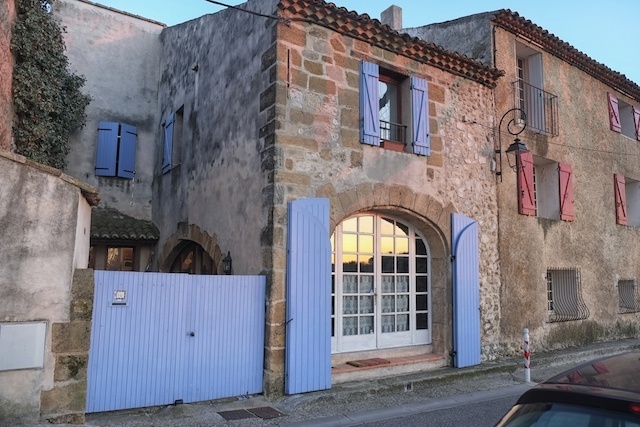 In early March our friend Laurie Greig called from Marseilles to let us know that she had just landed and would be spending a few weeks house sitting near Aix-en-Provence. The house was owned by some friends of hers. Did we want to take a trip to Provence for a few days? Yes! With little advance planning we caught a train from Gare de Lyon in Paris and met Laurie at the TGV station outside of Aix (pronounced ex). Laurie had rented a car (and knew how to drive it) – were we lucky or what? We headed to the house in the small town of Saint-Cannat. It was beautiful, facing a field on the edge of town. It had 3 stories with several bedrooms and two full baths, a big country kitchen, and a large living and dining area with a big fireplace – luxurious by our Paris apartment standards. Provence is a fairly large area with many many places to visit, so we took a modest approach. Paul Cézanne made numerous paintings of Mount Sainte-Victoire near his home in Aix-en-Provence, so we decided to explore that area one day. 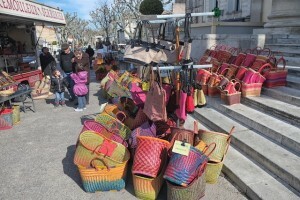 We wanted to see a good outdoor market, so we chose to spend a day in Saint Rémy and other small towns along the way. We also planned a day to see the Roman ruins at Orange and to visit the nearby wine country of the Rhône river. Since we had a really nice kitchen we planned a couple dinners at home. A couple nights we went out for dinner nearby, one time for our 25th anniversary at a fine hotel in Saint Cannat. The last day before catching the train back to Paris we stopped in Aix-en-Provence to walk around the old town area. We had mostly good weather, some days with warm sun and others with sun but also cold northwesterly winds called Mistrals. 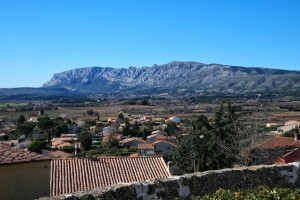 Our trip around Mount Sainte-Victoire was an exploration. We didn’t know what we might find there. Cézanne loved the mountain – he created more than 60 paintings of it. We followed the loop road (named Avenue Cézanne), first stopping on the south side at a forest area with hiking trails and an area information center. Next we visited the small village of Puyloubier, where we hiked around the narrow lanes, admiring the colorful houses and eventually visiting the local winery to buy a bottle for dinner. 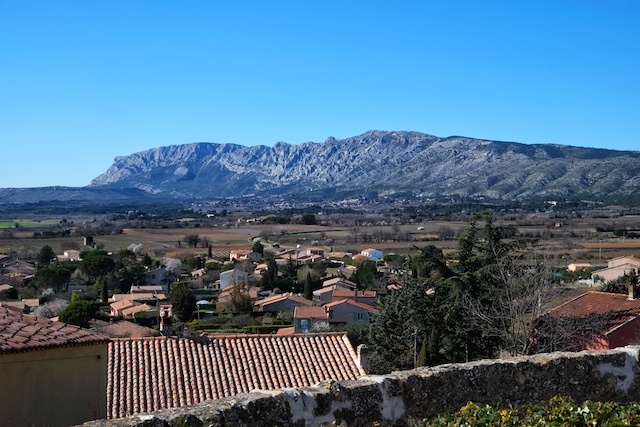 Further down the road we stopped to enjoy the beautiful views of the valley and Mount Saint Victoire from the village of Pourrieres. We stopped at a bar for a bite to eat and watched some men from the local village play a spirited board game that we didn’t understand. Then we continued driving to the north side of the mountain, stopping at Vauvenargues, where Pablo Picasso is buried. He bought the Château de Vauvenargues, situated at the foot of the mountain, and installed a studio there between 1959 and 1962. Picasso reportedly proclaimed to a visiting art dealer, “Cézanne painted these mountains and now I own them.” The Château was closed to the public – a sign at the gate refers visitors to the Picasso museum in Paris, which has also been closed the past couple years – maybe some day. We were hoping to take the hike up the mountain to visit the 19 meter high Croix de Provence, a cross prominently visible from below, but unfortunately we ran out of time. For a first day’s travel, it wasn’t bad. We felt more comfortable driving and reading the map. 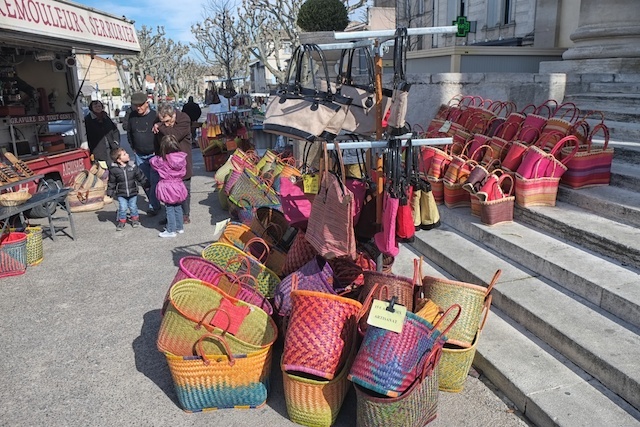 Our second day we visited the local market at Saint Rémy, where we enjoyed the colored baskets and shopped for all manner of clothing and food. We tracked down the birthplace of Nostradamus, born there in 1503. Vincent van Gogh was treated here in the psychiatric center at Monastery Saint-Paul de Mausole (1889–1890). He painted one of his most famous paintings, The Starry Night, as well as many paintings of the Monastery Saint-Paul, when he lived here. Also, Princess Caroline of Monaco chose Saint Rémy as her family’s home for a few years. In the afternoon we crossed the local river, the Durance, and stopped at a hillside town called Lauris, just because it looked interesting. The sun was nice and the views from the hillside were fabulous. There was a hillside garden and museum where we learned something about plant based dyes used to color fabric. 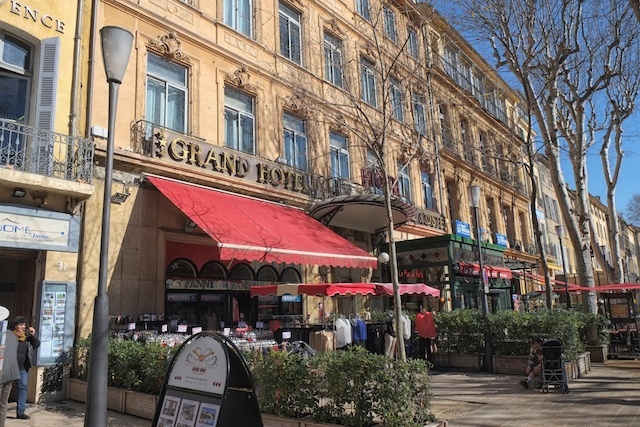 That night was also our 25th Anniversary, so we headed out on the town in Saint-Cannat to a very nice local hotel, the Mas De Fauchon, where Brenda, Laurie, and I had a wonderful dinner. The next day we headed for the city of Orange, which was founded by the Romans in 35 AD. The name Orange comes from the Carolingian Counts of Orange, Franks who established control in France in the 8th Century. The name stuck through the ages as various nobilities gained control. It was inherited by William the Silent, Count of Nassau in 1544. He also had extensive holdings in the Netherlands. William’s son Maurice helped establish the independent Dutch Republic, still ruled by the House of Orange-Nassau (why do you think their soccer uniforms are Orange?). A later son, William, became William III, protestant King of England and opponent of Louis XIV. William and his wife Mary ruled the British Isles as William and Mary. You might recall that we’ve already mentioned William III in this blog for his roll in conquering Ireland in 1691 as part of the history leading up to The Troubles. Europe is connected to itself all over the place. The town is renowned for its Roman architecture and its Roman theatre, the Théâtre antique d’Orange, is described as the most impressive still existing in Europe. The fine Triumphal Arch of Orange is often said to date from the time of Augustus or Tiberius, but is probably much later, perhaps Severan. The arch, theatre and surroundings were listed in 1981 by UNESCO as a World Heritage Site. 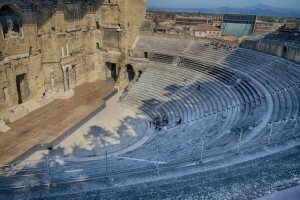 We were wowed by the theatre – still used as an outdoor amphitheater for plays and concerts. On site there were films showing performances by Pavarotti as well as other operas and numerous rock concerts. The triumphal arch, much smaller than the Arc de Triumph in Paris, is also much older and precious. After spending more time in Orange than planned (because it was so fantastic), we checked out a couple wineries in the center of the Côtes du Rhône region. We had time to sample wines from the Châteauneuf-du-Pape AOC and Gigondas AOC appelations (demanding levels of distinction that don’t require Côtes du Rhône on the label), and we also bought a bottle of Rasteau AOC (still to be opened). Damn! We stopped at the remains of a castle near the village of Châteauneuf du Pape. You might know that the Pope moved from Rome to Avignon (11 miles south) in 1309. Pope John XXII built a castle above the town in 1317. The castle later fell into disrepair, with some of the stone being used to build the town below. In World War II the Germans used the castle as a lookout post, and they tried to destroy it when they left the area; however, half the structure remains today. The wine appellation is a fitting tribute to this era of the Papacy in France. Our last day we decided we were ready to drive to Aix-en-Provence and see the old town part of the city. 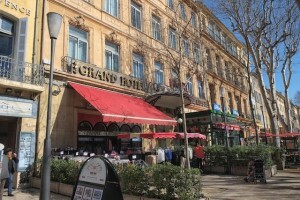 Aix hasn’t some of the ancient or important historical sites of other cities in Provence, but it is light and bright and clean – a wonderful place to spend a day. You can see from this sketch that one could take many trips to Provence before thoroughly exploring the area. Here is a link to a slide show with photos and captions showing more about the places we visited.